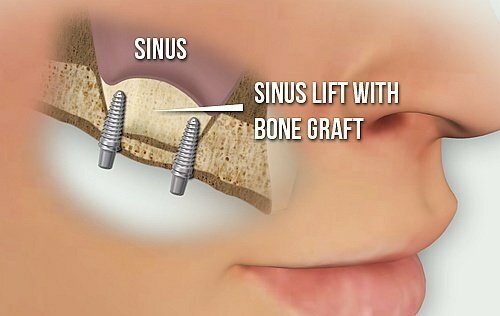 If your own bone will be used in the sinus lift, it will be taken from other areas of your mouth or body. In most cases, I will remove bone from your hip. You will need X-rays taken before your sinus lift so that I can study the anatomy of your jaw and sinus. You also may need a special type of computed tomography (CT) scan. This scan will me to accurately measure the height and width of your existing bone and to evaluate the health of your sinus. I will make a cut in the gum tissue where your back teeth used to be. The tissue is raised, exposing the bone. A small, oval window is opened in the bone. The membrane lining the sinus on the other side of the window separates your sinus from your jaw. This membrane is gently pushed up and away from your jaw. I may give you saline sprays to keep the inner lining of your nose wet and prescribe medicine to prevent congestion and inflammation. You also will be given pain medicine, an antibiotic and an antimicrobial mouthwash to help prevent infection. Most patients have only a little discomfort after a sinus-lift procedure. You will see the again after 7 to 10 days. I will evaluate the surgical site and remove stitches if they have not yet dissolved on their own. You might be asked to return a few more times to make sure the area is healing properly. The main risk of a sinus lift is that the sinus membrane could be punctured or torn. If the membrane is torn during the procedure, I will either stitch the sinus tear or place a patch over it. If the repair is not successful, I may stop the procedure and give the hole time to heal. I can always redo the sinus lift once the membrane has healed. This usually takes a few months. A healed membrane tends to be thicker and stronger, which means a second attempt at a sinus lift is likely to be successful. However, other factors also affect success. Vertical bone loss in the upper jaw. Post traumatic upper jaw bone loss.